Milla Villa is a luxury villa with private pool located in the natural park of Monte San Bartolo, near Pesaro. The villa is on two floors. On the ground floor is a large and bright living room with French windows overlooking the garden. The large kitchen has a large dining table and a fully equipped kitchen. The decor is beautiful with great attention to detail. The style is modern and very tasteful. 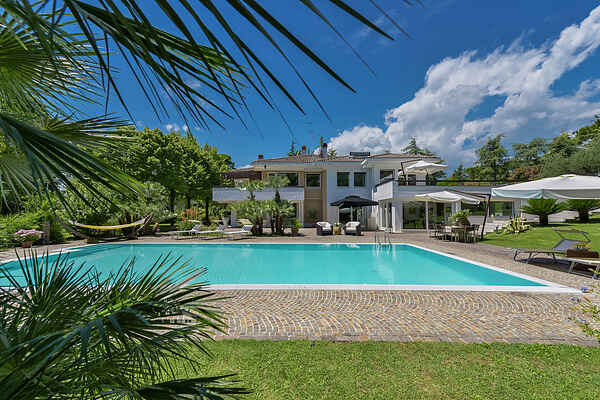 The villa is surrounded by a lush garden, a large swimming pool, ideal for relaxing on warm days. The Monte San Bartolo is between Gabicce Mare and Pesaro and is a protected area that consists of rural and forested landscapes. For lovers of trekking, the park offers many possibilities. There are also beautiful small beaches. The park and the coast are known for the very rare steep cliffs and caves. Villa Milla is an exclusive villa, ideal for pleasant moments in the company of friends and family. A luxury villa with lots of comfort and privacy. There is a free wine tasting for guests. why not enjoy a Shopping Tour Luxury Brands at the Outlet Village IL CASTAGNO. Free visit of Prada showroom and other luxury shops ( Pollini, Roberto Botticelli, Pantofola d’oro, etc.). Visit of TOD's outle for 4 people we offer a wine tasting at a local winery of the Marche for a visit and experience the discovery of the dop and DOCG wines as Pecorino, Passerina and Rosso Piceno Superiore In de regio Le marche worden ontzettend veel activiteiten georganiseerd: Carnaval in Fano (www.carnevaledifano.com) met praalwagens en folkloristische groepen. De parade vindt elk jaar plaats langs de Viale Gramsci. In de stad Fermo is elk jaar een evenement van typisch locale producten waaronder de “oliva all’ascolana”, kaas, salame, vin cotto, wijnen en olijfolie. In de maart (www.tipicita.it). De laatste zondag van mei zijn alle wijnhuizen open. Leer alles over wijnen en proef de wijnen (www.movimentoturismovino.it). Het festival van de Apenijnen. Een festival van mei tot juli in Ascoli Piceno met shows, concerten en culturele activiteiten (www.festivaldellappennino.it). Film festival: elk jaar in juni is er een belangrijk filmfestival in Pesaro(www.pesarofilmfest.it). Een muziekfestival in juni, meer informatie vind je op de website (www.musicultura.it). Straatartiesten festival. In de stad Fermo kan je allerlei spektakels van straat artiesten bekijken (eind juni). Ontzettend leuk! www.veregrastreet.it/it/il-festival CaterRaduno: concerten en live radio uitzendingen eind juni in Senigallia in het centrum. www.caterueb.rai.it Wil je zien hoe ijs gemaakt wordt? Ga dan eens kijken op het ijsfestival begin juni in Agugliano (www.gelatoartigianalefestival.it). In de stad Macerata is elk jaar in juli en augustus een opera festival. (www.sferisterio.it). Je kan de opera’s zien van Rigoletto en La Boheme. Zeer de moeite waard!! In the region of Le Marche organized lots of activities: Carnival in Fano (www.carnevaledifano.com) with floats and folk groups. The parade takes place every year along Viale Gramsci. In the city of Fermo is an annual event of typical local products, including the "oliva all'ascolana", cheese, salami, vin cotto, wines and olive oil. The March (www.tipicita.it). The last Sunday of May, all wineries open. Learn all about wines and taste the wines (www.movimentoturismovino.it). The festival of the Apennines. A festival from May to July in Ascoli Piceno with shows, concerts and cultural activities (www.festivaldellappennino.it). Film festival: Every year in June there is an important film festival in Pesaro (www.pesarofilmfest.it). A music festival in June, more information can be found on the website (www.musicultura.it). Street festival. In the city of Fermo you can see all kinds of spectacles of street artists (late June). Incredibly fun! www.veregrastreet.it/it/il-festival CaterRaduno concerts and live radio broadcasts in late June in Senigallia in the center. www.caterueb.rai.it Want to see how ice cream is made? Then have a look at the ice festival in early June in Agugliano (www.gelatoartigianalefestival.it). In the town of Macerata each year in July and August an opera festival. (www.sferisterio.it). You can see the operas Rigoletto and La Boheme. Very worth it !! Futura Festival in Macerata in July and August. (www.futurafestival.it) with concerts and shows. In July and August there is a dance festival in Macerata Civitanova Danza. Mordern dance. The event takes place in three theaters. www.civitanovadanza.it Verdicchio in festa is a wine festival in Montecarotta in July. Verdicchio is one of the most famous wines of the region. Do you like ham? Visit the Ham Festival in July in Carpegna. It is the feast of prosciutto crudo. In August you can go to the Rossini Opera Festival (www.rossinioperafestival.it). Beautiful and special! In the town of Senigallia every year in early August a festival of American music: www.summerjamboree.com Rock'n roll, jive, blues and much more! Sagra or Vernaccia, a local party with good food and good wine. www.comune.serrapetrona.mc.it Rosso Conero Festival: in September a festival to promote the red wine of the Conero area Camerano. www.turismocamerano.it Festa dell'Uva: a wine festival in Arcevia. Taste delicious wines! www.arceviaweb.it Pane Nostrum is an event in Senegallia where you can see how traditional bread is baked. www.panenostrum.com The festival of the white truffle in San'Angelo Vado (www.mostratartufo.it). On the weekends of October and November.